1 Ph.D. in Economics, professor - researcher National Research University "Higher School of Economics", Moscow, Russia. E-mail: beno09@yahoo.com. Address: Myasnitskaya Street No. 20, Moscow, C.P. 101000. The author thanks to DGAPA and the Faculty of Economics of the UNAM for previous support for this investigation during his postdoctoral research stay. Also, author tanks helpful comments of Noemi Levy, Alejandra Peña and Evgeniya Guseva. This article was received on December 8 2010, the adjusted version was remitted on May 24 2011, and its publication approved on July 10 2011. Palabras clave: globalización financiera, desarrollo financiero, panel de datos dinámico. JEL: C33, F36, F39, G19, O16. Keywords: financial globalization, financial development, dynamic panel data. JEL: C33, F36, F39, G19, O16. Mots-clés: mondialisation financière, développement financier, données de panel dynamiques. JEL: C33, F36, F39, G19, O16. Financial development is a key factor to get greater growth and economic development rates, because it influences on saving decisions and investment (Levine, 2005; Ang, 2008). In consequence, it is relevant to know what determines financial development. There is a body of research that examines financial globalization shaping financial development; this nexus is the main topic of this paper. Over the 80s Latin America started policies of liberalization, particularly, after 1987 most of the countries liberated their capital account and strongly activated the actual process of financial globalization. The consequence was a turbulent period, with debt and financial crisis in the last 30 years. Notwithstanding, it is possible to argue theoretically and empirically that financial globalization promotes financial development, because it reduces the power of interest groups (opposed to development of the financial system), allows the adaptation of the institutional structure, in favor of the best practices and financial innovations, and, in general, because it allows a better job at providing basic financial functions. It is worth noticing that financial system is a channel through which financial globalization can influence growth and economic development, therefore, that relationship deserves direct theoretical, empirical and analytical attention. Under these conditions, this paper is motivated by the following question: does financial globalization cause financial development in Latin America? The paper is as follows. Section 2 discusses shortly the theoretical relationship between financial globalization and financial development, with special attention to impacts on basic financial functions. Also, it describes previous empirical studies and their main results. Section 3 specifies an econometric model (dynamic paneldata) and describes the data sets (sample of Latin American countries). Section 4 reports and discusses the econometric results. Finally, it presents conclusions. For mainstream economists there are no doubts about the potential advantages of financial globalization.2 Obstfeld (2008, p. 2) points out "over the longer term, an internationally open financial system is likely to be more competitive, transparent, and efficient than a closed one". Free capital mobility implies an efficient allocation of resources in a global scale. However, the idea that financial system promotes economic development inside a country is translated into a global scale. But, Latin American growth economic rates in the last 30 years had been smaller than in the 60s and 70s.4 Also, the financial uncertainty is a characteristic of the current globalization. It is obvious that financial crises, and their easy infection, are the main warning signals against financial globalization. But, Bailliu (2000); Eichengreen and Leblang (2003); and Bekaert, Harvey, and Lundblad (2005) argue that the impact on economic development of financial globalization will be positive if countries have a developed and good regulated financial system. Under these conditions, the allocation of capital will be efficient and the incidence of financial crises will be smaller. 1. Produce information ex ante about possible investments and allocate capital. 2. Monitor investments and exert corporate governance after providing finance. 3. Facilitate the trading, diversification, and management of risk. 4. Mobilize and pool savings. 5. Ease the exchange of goods and services. A better performance of these functions indicates a bigger financial development. In the world there are financial systems that are more developed than others, that is to say, financial systems that perform basic functions better (more efficiently) than others, and thanks to financial globalization it is possible to import a developed financial system, through a process of catching up. Rajan and Zingales (2003) support the hypothesis that financial systems are not developed because there are interest groups (incumbents) that oppose financial development because it harms their power and benefits. But, financial and trade openness weaken these interest groups, because the external agents press the national financial system to perform better its basic functions (through competition). Besides, when an economic agent invests in another country it is supposed that it also transfers financial technology and innovations. Financial globalization chooses the most productive technology (Saint Paul, 1992 as cited in De Gregorio, 1999). Analyzing financial globalization and each one of the basic functions that a financial system should perform to get a higher level of financial development is feasible: First, financial globalization will destroy private and privileged information in financial markets of the interest groups, because the financial system (its organizations, institutions, and the own market) will spread all available information, as a result of confrontation and new demands of the external economic agents, who are not subordinated to interest groups. Specifically, the participation of external conomic agents generate competition among them and with local agents, and in that way, it is achievable to produce more truthful and deeper information about domestic financial market conditions. On the contrary, if external economic agentsare interested in collusion and cooperation with domestic interest groups, financial system will not be able to give all available information to all agents. Second, with financial globalization it is feasible that the best practices and methods of financial supervision spread around the world and improve corporate governance. Morck and Steier (2005) point out that contrary to the United States, most of the capitalist countries have corporations that belong to the richest families and with a pyramidal organization, therefore, the allocation of capital responds to these interest groups and their arrangements with the state. But, the arrival of external economic agents will confront bad decisions in allocation of capital of the interest groups, assessing firms and monitoring managers, so it will improve corporate governance (Levine, 2002). On the contrary, Shleifer and Vishny (1986) argue that the liberalization can weaken corporate control, because it reduces the incentives of shareholders, thanks to more liquidity, to supervise borrowers and managers. Third, financial globalization favors risk diversification. This is obvious in a globalscale, because domestic economic agents can share risks with foreign agents in domestic and foreign financial markets. This way, in the peak time a country can lend to the foreigner, and in the recession, it can request borrowed money, which helps to mitigate the impacts up and below on the income level, and in consequence, also in the consumption and the investment. Obstfeld (1994) argues that international risk diversification allows the world economy to move from a portfolio with low risk and low return to one with higher risk and higher return. In addition, financial contracts that favor risk diversification will spread in all countries. On the contrary, if agents prefer domestic assets or non tradable goods and international trade has high transaction costs, the incentives to international diversification of risk could decrease. Also, international financial markets are incomplete, risk of exchange rate and expropriations have not any insurance against all future contingencies (Kose, Prasad, and Terrones, 2007). Fourth, if capitals flow freely around the world, it will favor mobilization and pooling of savings in a global scale. Domestic savings are able to go to foreign financial markets looking for better returns, and the domestic financial market has to improve methods to pool savings, as a result of international competition. Furthermore, it is supposed that external saving does not substitute domestic saving. On the contrary, if financial globalization offers better protection against uncertainty, this may in fact lower the needs to save for the future, which might lead to a better stock market without an increase in savings (Devereux and Smith, 1994, as cited in Naceur, Ghazouani and Omran 2008, p. 677). Fifth, financial globalization reduces international transaction costs and it favors global relationship between the financial and real sector. In others words, globalization facilitates exchanges in the real economy in a global scale. The financial globalization - financial development nexus, has specially been approached in empirical studies. Levine and Zervos (1998), De Gregorio (1999), and Klein and Olivei (2001) were the first to examine this nexus, shortly after Chinn and Ito (2002, 2006) discussed the nexus with the introduction of institutional variables. Later on, Law and Demetriades (2006); Huang W. (2006); Calderón and Kubota (2009); Law (2009); and Baltagi, Demetriades and Law (2009) extended the literature, especially they used econometrics models with a sample of developed and underdeveloped countries. Tovar (2011, p. 119) presents an extensive review of the literature, including methodologies, sample of countries and main results. There are few case studies or methodologies applied to special groups of countries: Buitre and Taci (2003) analyzed a sample of transition countries, Naceur et al. (2008) a sample of 11 countries of the Middle East and North Africa region, Ito (2006) put special attention on 15 Asian countries, Ahn (2008) analyzed Korea, and Law (2008) studied Malaysia. This paper analyses and focuses on 19 Latin American countries, based on methodologies and variables employed in Tovar (2011). Financial development, as dependent variable, has been approached principally with indicators of credit (liquid liabilities over GDP and private credit over GDP) and with indicators of the stock market (stock market capitalization, stock market total value as a ratio of GDP, and stock market turnover). Rarely the literature uses the neologism financial globalization, the studies especially talk about financial openness like explanatory variable of financial development, and the main indicators to approach this variable are based upon the IMF's categorical enumeration reported in Annual Report on Exchange Arrangements and ExchangeRestrictions (AREAER). Few studies employ the international flows of capital or some measure of financial integration. The econometric models used to evaluate the financial globalization - financial development nexus have improved with the time. In the beginning, studies employed more graphic analysis and least squares (LS); later models with panel data (DP); and recently dynamic panel data and generalized method of moments (GMM). The regressions are controlled with income level, inflation, and trade openness. Chinn and Ito (2002) were the first to take account of institutional variables, according to La Porta, Lopez-de-Silanes, Shleifer, and Vishny (1998), who highlight that institutional framework is an important factor to explain financial development. In general, the results of the empirical tests suggest a positive effect of financial globalization on financial development, especially in developed countries. In the case of underdeveloped countries (like the majority of Latin American countries), the evidence is mixed, but the positive effect is found in samples of emerging economies (including Mexico, Brazil, Argentina, and Chile). In addition, the results, after inclusion of institutional variables, suggest that the impact of financial globalization on financial development will be positive if a country has good quality of institutional structure. After revising different econometric methodologies that have been used to study the financial globalization - financial development nexus, the best option is to use a dynamic GMMestimator, developed by Arellano and Bond (1991), in two stages because it uses a consistent estimate of the variance-covariance matrix, thus relaxing the assumptions of independence and homoscedasticity, and correcting problems of second-order serial correlation. where FD is a measure of financial development, FG is a measure of financial globalization and X is a vector of control variables: log per capita GDP (constant 2000 US$) (GDP), the inflation rate (INFLA) and log trade openness (XM) measured as the ratio of the sum of exports and imports to GDP. The fundamental hypothesis of interest is that financial development depends positively upon the level of financial globalization. Chinn and Ito (2002, 2006) argue that it is difficult to control for secular trends in financial deepening in the context of the panel regression in levels with annual frequency, due to the large cyclical variations in the financial deepening variables, along with trending behavior of the explanatory variables. Their solution is to use the average annual growth rate over a five year period; in order to avoid problems of endogeneity associated with short term cyclical effects (other studies used the same strategy). The data are drawn from the World Bank's World Development Indicators (WDI) 2005 and 2008, and the databases associated with Beck, Demirgüç-Kunt, and Levine (2009). The analysis is based upon data recorded at an annual frequency, over the 1988-2005 period, covering 19 Latin American countries. Details are reported in appendix, Table A summarizes descriptive statistics, Table B shows correlation matrix and Figure A shows line graphics of means. In the literature, the main indicators to approach financial development are measures of credit and stock market, other financial intermediaries such as pension funds and insurance companies are underestimated and the informal financial sector is omitted. Levine (2005) points out that the main problem in empirical studies is the proxies for financial development, they do not frequently measure very accurately the concepts emerging from theory. 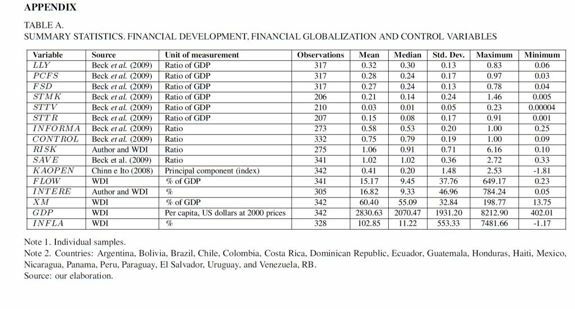 Empirically, it has been showed that high levels in ratio M2/GDP or credit/GDP do not necessarily imply a developed financial system (Ang, 2008). 1. Liquid liabilities over GDP (LLY). 2. Private credit by deposit money banks and other financial institutions over GDP (PCFS). 3. Financial system deposits over GDP (FSD). In the appendix, Table A shows that the mean and the median of these indicators are close, and have a small standard deviation; then themajority of Latin American countries have similar rates. Chile and Brazil have high rates, but also other Central American countries (not Mexico). Panama has the highest rates: 0.61 (LLY), 0.66 (PCFS), and 0.58 (FSD), just to compare, USA has 0.67, 1.45, and 0.64, respectively (means of the same period, 1988-2005). 1. Stock market capitalization over GDP (STMK). 2. Stock market total value traded over GDP (STTV). 3. Stock market turnover ratio (STTR). In addition, the investigation uses other four measures to approach with more fidelity the financial development, because they approach four of the five basicof the financial system.12 The first of them is bank concentration (INFORMA), the assets of three largest banks as a share of assets of all commercial banks. It is a measure of competition, and for mainstream economists, more competition corresponds to prices that reflect all available information more faithfully. Therefore, this indicator approaches the first function of the financial system: provide more and better information. Latin American countries have similar rates of bank concentration, the mean is 0.58 and the standard deviation is 0.20 (see Table A), it is difficult to say who has the best performance, but Haiti has the worst, it has a high bank concentration (low competition), the mean is 0.97, USA, for example, has 0.28. Following the study of Y. Huang (2005), this investigation uses deposit money bank assets over (deposit money + central) bank assets (CONTROL), the indicator allows to approach the function of corporate governance, because it approaches the advantage of financial intermediaries in channeling savings to investment, monitoring firms, influencing corporate governance, and undertaking risk management relative to the central bank. 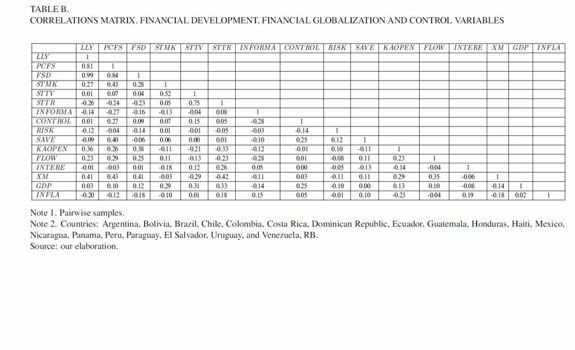 Latin American countries have similar rates of CONTROL, the mean is 0.75 and the standard deviation is 0.19 (see Table A), USA has a mean of 0.92. Again, it is difficult to say who has the best performance, but Colombia, for example, has a mean of 0.95, the worst rate corresponds to Nicaragua with 0.36, and Haiti has 0.42. The third function of the financial system, diversification of risk, is approached with base in studies that relate consumption growth variability with diversification of risk. Particularly, based on the studies of Prasad et al., (2003), Bekaert et al., (2006), and Kose et al., (2007), this investigation uses fluctuations in consumption over income. First, the growth in real consumption for country i between year t and t + 1 is calculated, then the growth rate variability is defined as the standard deviation of the consumption growth rate estimated over 5 years. The same is calculated for GDP. The indicator RISK is consumption growth rate variability over GDP growth rate variability; if it is smaller it implies a larger diversification of risk. In this case, Latin American countries have a bigger variance, the mean is 1.06, the median is 0.91, and the standard deviation is 0.71 (see Table A). USA has a mean of 0.75 and the big countries of the region (Argentina, Brazil, Mexico, and Chile) have rates close to the mean. The best performance corresponds to small countries like Dominican Republic 0.53, Panama 0.61, Uruguay 0.75, and Paraguay 0.77. The fourth indicator is bank credit over bank deposits (SAV E), which approaches the ability of banks in channeling savings of the society toward the private sector. In consequence, it approaches the fourth function of the financial system: mobilize and pool savings. The mean and the median is the same (1.02), and the standard deviation is small (0.36), so Latin American countries have similar performance. USA has a mean of 0.79,13 Chile has the best performance (1.37), and the worst corresponds to Haiti (0.49). Chinn and Ito (2002) calculated the indicator KAOPEN, the first principal component of: existence of multiple exchange rates (k1), restrictions on current account (k2), restrictions on capital account transactions (k3), and requirement of the surrender of export proceeds (k4). k1, k2, and k4 ponder the intensity of capital controls. Thanks to these characteristics, in this investigation KAOPEN is used to approach financial openness, therefore, financial globalization. Latin American countries have a mean of 0.41, the median is 0.20, and a standard deviation of 1.48. USA has a mean of 2.53 (this is the maximum possible rate), Mexico 0.60, Argentina 0.39, Chile -0.55, and Brazil -1.12, only Panama has a high rate (2.53). Financial openness is an important characteristic of financial globalization, but the magnitude of international flows of capital is the basic reflex. The foreign currencies, stocks, bonds, and other financial instruments are moving around the world like never before. Thisway, to measure financial globalization it is necessary to know how big are those flows. 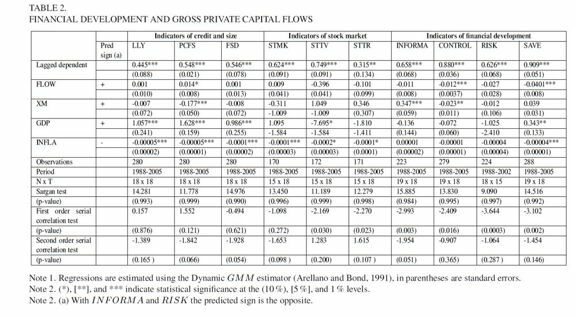 This investigation uses gross private capital flows as a ratio to GDP (FLOW), the sum of the absolute values of direct, portfolio, and other investment inflows and outflows recorded in the balance of payments financial account, excluding changes in the assets and liabilities of monetary authorities and general government. TheLatin American mean is 15.17 and the standard deviation is 37.76,USA has amean of 10.67,15 Chile 19.1, Argentina 14.1, Mexico 8.34, and Brazil 8.16, Panama has the highest rate (97.6). Also, financial globalization implies a process of financial interdependence. If goods, services, and factors of production can move freely among countries, then the market should balance their prices, reflecting the process of economic interdependence and integration. The price of capital is the interest rate and if capital can move freely among countries, their interest rates should converge (Obstfeld and Taylor, 2003).16 To measure the convergence process, this study employs the variable integration of real interest rate (INTERE) calculated subtracting the interest rate of a country from the reference interest rate (average of the G7, United States, Canada, England, Italy, France, Japan, and Germany) in absolute terms. The closer to zero this difference is, the greater the integration and financial globalization. 17 Latin American countries have a mean of 16.82 and standard deviation of 46.96; Mexico has a very good integration (2.83); other interesting countries are Panama (4.55) and Chile (5.26); Brazil has a bad integration (49.71). As in Tovar (2011), this investigation approaches the financial globalization using three indicators of financial globalization, each one measures a substantial part of globalization, instead of discussing if they are indicators de facto or de jure. Also, together with the typical measures of financial deepening, I use four indicators to approach in a better way the basic functions of the financial system; therefore, they are better indicators of financial development. Principally, the paper differs from Tovar (2011) because the analysis and the econometric test include a sample of Latin American countries that had been not studied before. Equation  shows the transformation of the model , to use as measure of financial globalization the indicator KAOPEN (financial openness). Table 1 presents the main results. The measure of financial openness enters with positive and statistically significant coefficients at the 1% level in the cases of LLY and FSD, indicators of credit and size of the financial system. Also, KAOPEN enters with the predicted sign and statistically significant coefficients at the 1% level in the cases of CONTROL and RISK; that is to say, financial openness favors the corporate governance and the international diversification of risk in the Latin American countries. But, there is no evidence of any significant relationship with the growth of the stock market and with the rest of indicators. Trade openness lacks the predicted sign and significant coefficients in the cases of LLY , PCFS, INFORMA, and CONTROL, it has the predicted sign in the case of RISK, and it has no other significant relations. Therefore, the evidence suggests that trade openness does not favor financial development. The control variable GDP and INFLA enter with the predicted sign and significant coefficients in the majority of the cases. Equation  shows the transformation of the model , to use as measure of financial globalization the indicator FLOW (gross private capital flows). Table 2 presents the main results. The capital flows enter with positive and statistically significant coefficient at the 10% level only in the case of PCFS, indicator of credit. Also, FLOW enters with negative and statistically significant coefficients at the 1% level in the cases of CONTROL and SAVE; consequently,capital flows do not exert corporate governance and do not mobilize and pool savings in the Latin American countries. There is no evidence of any significant relationship with the growth of the stock market and with the rest of indicators. The control variables have similar results in comparison with model . It is interesting to notice that trade openness enters with the not predicted sign and statistically significant coefficients in the cases of PCFS, INFORMA, and CONTROL. With the rest of dependent variables there are no significant relations. Equation  shows the transformation of the model , to use as measure of financial globalization the indicator INTERE (integration of real interest rate). Table 3 presents the main results. The measure of financial integration enters with predicted sign and statistically significant coefficients at the 1% level in the cases of LLY , PCFS, CONTROL, and SAVE; that is to say, financial integration promotes the credit, exerts corporate governance, and mobilizes and pools savings. Furthermore, INTERE enters with the predicted sign and statistically significant coefficients at the 5% and 10% level in the cases of FSD and RISK. Therefore, financial integration encourages financial system deposits and favors the international diversification of risk in the Latin American countries. Regardless, financial integration has no significant relationship with the stock market. 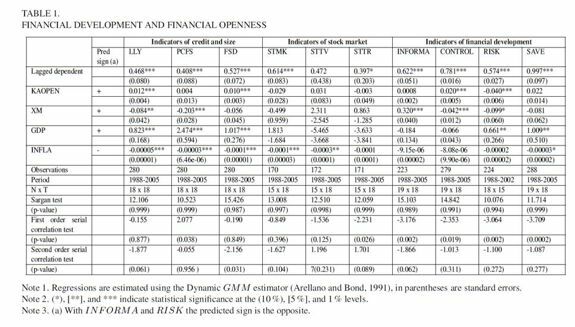 Trade openness does not have the predicted sign and significant coefficient at the 1% level, only in the case of PCFS and INFORMA, and it enters positive and statistically significant coefficients in the cases of STTV and SAVE. The control variable INFLA enters with the predicted sign and significant coefficients in the majority of the cases, and the control variable GDP enters with the contrary predicted sign and significant coefficients in the cases of STTV and STTR, suggesting that in the context of financial integration, the income level of Latin American countries has a negative relationship, especially, in the growth of the stock market. In general, only the indicator of financial integration shows evidence in favor of the main hypothesis, the other two measures of financial globalization suggest that there is not a significant positive impact on the financial system. Particularly, financial globalization exerts corporate governance, although it is related negatively to capital flows, and favors international diversification of risk. It is not possible to affirm that financial globalization encourages other basic financial functions. There is evidence that the three indicators of financial globalization have positive impacts on somemeasures of credit and size of financial system. But, it is clear that financial globalization does not have any significant relationship with the growth of the stock market, neither positive nor negative. Theoretically, financial globalization is able to favor the growth and development of domestic financial systems, because the best financial practices are able to travel around the world through a process of catching up. The empirical evidence about the financial globalization - financial development nexus has grown considerably in the last ten years, however, used indicators of financial development were not well related to the theory. This investigation, as Tovar (2011),besides the typical indicators of credit and stock market, employed new indicators of financial development related to basic financial functions. The previous empirical results used samples with developed and underdeveloped countries, and found positive impacts on financial development of financial globalization; but in samples of underdeveloped countries the evidence is not supported. In the same sense, the results of this investigation suggest that in Latin American countries it is not possible to find strong evidence of positive impacts, especially on the stock market. At least, it is not possible to argue a negative impact. The results are robust to a big range of alternative measures. An interesting result is that trade openness is related significantly and negatively to some indicators of growth and financial development. This is evidence against the hypothesis of Rajan and Zingales (2003) who argue that openness, either financial or trade, favors financial development. Financial integration (convergence of real interest rate) is the only measure of financial globalization that enters in the model with the predicted sign and statistical significance; therefore, for policy makers in Latin American countries the advice is to follow a strong integration and at the same time expand their policies of liberalization and facilitate the free flows of capital (their levels are lower than thosein developed countries). On the other hand, one could argue that is possible to wait until these countries get a developed financial system, and later facilitate the openness processes that will enhance the financial development. Future research must help to find other determinants of financial development in underdeveloped countries, and indicate what conditions are required to get positive impacts from financial globalization. Some investigations suggest that institutional framework is a key determinant, then it will be necessary to elaboratemore sophisticated institutional indicators, because the actual measures do not change significantly in time and, by this reason they are not useful in empirical tests. Finally, it is necessary to point out that theoretical contribution about the financial globalization - financial development nexus is supported on empirical studies, therefore, it is indispensable to develop a better theory. 2 Financial globalization is the ongoing process of greater financial interdependence among countries, it is reflected in the increasing volume of international financial flows, and it is accompanied with policies of liberalization. Definition based on Fisher (2003). 3 To know more about effects of the financial globalization under asymmetric information, the reader can see Stiglitz (2000), the neoinstitutional debate in Arestis, Nissanke, and Stein (2005) and the postkeynesian critic in Levy (2009). 4 For further discussion on financial globalization - economic development nexus, the reader may consult Obstfeld (2008), he presents a very good summary of the literature. It is interesting to mention that empirical evidence shows mixed results. 5 For a deeper review of financial globalization - financial crisis nexus, the reader may refer to Arestis and Singh (2010). They present the institutional and postkeynesian point of view, and Tornell, Westermann, and Martínez (2004) elaborated empirical evidence and referred to other interesting empirical and theoretical studies. This literature has few agreements, and the discussion is bigger after the last global financial crisis. 6 We allow a maximum of 2 lags to be used as instruments, to keep a sensible relationship between the number of cross-sectional observations and the number of over-identifying restrictions. This can help to avoid the over-fitting biases that are sometimes associated with using all the available moment conditions. 7 Indicators KAOPEN (financial openness) and INFLA (inflation) have no logarithmic transformation, because they are able to have some negative values. 8 The coefficients represent short-run effects; the long-run effects can be derived by dividing each of the coefficients by 1 - ρ1 (the coefficient of the lagged dependent variable). The moment conditions are: E[ΔuitDFt-k] = E[ΔuitXt-k] = 0 ∀k > 1, where X are the explanatory variables. It is assumed that the error term is not serially correlated, particularly; there is not a second order serial correlation. And Sargan's over-identification test is employed to validate the instruments. For further discussion, see Arellano and Bond (1991). 9 GDP is included like control variable because the literature suggests a reverse causality with financial development (Levine, 2005; Calderón, and Liu, 2003). Inflation is included because it implies frictions in markets and credit rationing (Roubini and Sala-i-Martin, 1995; Boyd, Levine, and Smith, 2001). And trade openness is a control variable because the empirical studies found a positive correlation with financial development (Do and Levchenko, 2004; Huang and Temple, 2005; Law, 2009; Baltagi et al. 2009). Also, literature suggests the inclusion of institutional variables, La Porta et al. 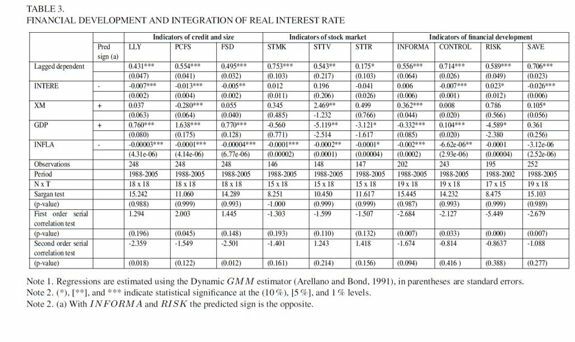 (1998) argue that institutional framework is an important determinant of financial development, and the empirical studies about financial globalization - financial development nexus include institutional variables like explanatory variables. But, the available institutional variables do not change significantly in the time, and there are not good indicators of institutional levels for Latin American countries; so it is better to assume that Latin American countries have similar levels of institutional development, specifically, they have the same legal origins (French), and La Porta et al. (1998) argue that legal origin explains satisfactorily the financial development. Then, investigation does not includes institutional variables. 10 Baltagi et al. (2009) argue that financial development indicators are considerably persistent and history dependent, then, they used a logarithmic transformation, like in this paper. 11 These six indicators include a deflation method, for details see Beck et al., (2009). 12 It was not possible to find a good indicator of the fifth function (ease the exchange of goods and services). 13 This is a small rate among rich countries, for example, United Kingdom has a mean of 1.41. 14 For further discussion, see Edison and Warnock (2001), Edwards (2001), Edison et al., (2002), Lane and Milesi-Ferretti (2006), and Chinn and Ito (2008). 15 This is a small rate among rich countries, for example, United Kingdom has a mean of 58.95. 16 Central banks frequently intervene on the course of interest rates; the market does not act freely. Then, the convergence of interest rates has some bias to measure financial globalization, but it is still a good indicator of financial liberalization in times of globalization. 17 To measure financial interdependence, other studies used international arbitrage pricing models, but the indicator INTERE is simple and has no relevant differences with other indicators. 18 The model was transformed in different forms, but it was not possible to correct the problem, and like Baltagi et al. (2009, 292), the solution is to notify.